The Annual Editions series is designed to provide convenient, inexpensive access to a wide range of current articles from some of the most respected magazines, newspapers, and journals published today. 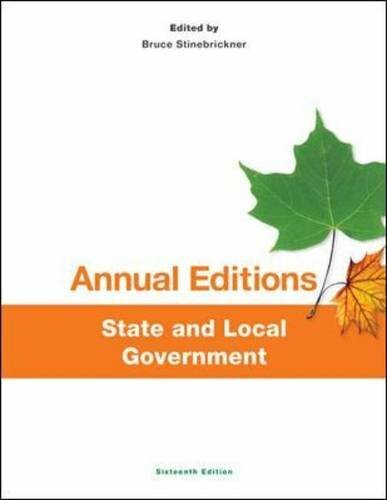 Annual Editions are updated on a regular basis through a continuous monitoring of over 300 periodical sources. The articles selected are authored by prominent scholars, researchers, and commentators writing for a general audience. Annual Editions volumes have a number of organizational features designed to make them especially valuable for classroom use: a general introduction. an annotated table of contents. a topic guide. an annotated listing of supporting World Wide Web sites. a brief overview and Learning Outcomes at the beginning of each unit, and a Critical Thinking section at the end of each article. Each volume also offers an online Instructor's Resource Guide with testing materials. Visit ww.mhhe.com/annualeditions for more details.